This peanut butter ball recipe is one of my “traditions” for the Christmas holiday. Kids and adults love’ em. Ever get a craving for rich milk chocolate surrounding a luscious peanut butter center? These little candies will fit the bill. Did you know they are sometimes affectionately called buckeye balls? The only difference I can tell between the two are the peanut butter balls are completely covered with chocolate. The buckeye balls are covered three quarters with chocolate so you can see the peanut butter on the top. Personally, I want mine completely covered in chocolate. You are free to do what you want. So if you enjoy Reeces peanut butter cups then you will love these chocolate peanut butter balls. They are easy to make, though they are time consuming as you have to roll each individual ball and then hand dip them in chocolate. But believe me they are worth the effort. One of the great things about peanut butter balls (besides the fact that they taste so good) is that you can make them up ahead of time, say 2 or 3 weeks, store them in the freezer and they are ready when you are. Valentines day is another great time to make these. When February 14th rolls around, try giving your valentine a box of your own homemade no-bake peanut butter balls and cupid’s arrow will be flying. You can make these right at home anytime you want because now you have the recipe. Mix peanut butter, butter and vanilla with an electric mixer until well blended. Add the powdered sugar, a little at a time, blending with the mixer until all the sugar is mixed in. The dough will be slightly crumbly. Form the dough into 1 – 1 1/2 inch size balls by rolling the dough between your hands. Set formed balls on a plate or cookie tray. Heat the double boiler to the lowest boil you can achieve. Do not let the water touch the bowl/pan that the chips are in. When the chips are melted, dip one peanut butter ball into the chocolate with tooth picks. Roll the ball in the chocolate until it is well covered. Remove the peanut butter ball with tooth picks to cookie sheets lined with waxed or parchment paper. Once they are cool you can put them in plastic containers in the refrigerator or freezer. They will keep for several weeks. 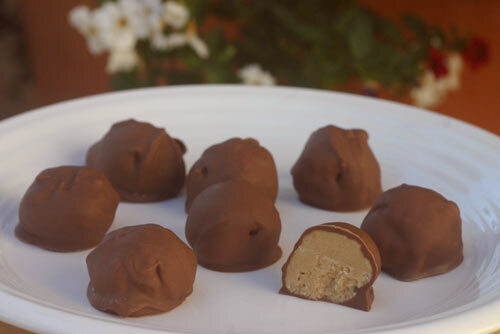 This peanut butter ball recipe with delight your favorite chocolate and peanut butter fan. I guarantee it!